I’ve been a member of Fabletics for about two years. If you’re not familiar, it’s a subscription site for athletic gear, ostensibly designed (curated?) by actress Kate Hudson. I signed up for Fabletics due to a great deal where you could get a complete workout outfit for half price – $25 – for the first month. This was over two years ago, and the outfit I received was only meh. I think there were some knee length pants made of t-shirt fabric but cut like sweatpants along with a tank top that had ridiculously oversized arm holes. I wore the pants sometimes at home but the tank top was so gross that it got tossed. Since then, I’ve been diligent to check out their new styles every month but I usually skip buying something. If you skip the month (pretty easy to do with a few clicks on their site) within three calendar days, you’re golden. If not, they charge you $49.95, which you can store as a credit and use in a future month to buy their gear, which now includes workout clothes, coats, bags, etc. The few times I’ve bitten and ordered new items, I’ve been only moderately impressed. Out of the 24+ months I could have selected new outfits, I probably only ordered four times. I can recall a pair of navy joggers (Sidenote: where are they, anyway? I would wear these if I knew where they were. Sigh) that were of ok quality, although straight up Fruit of the Loom t-shirt cotton fabric. 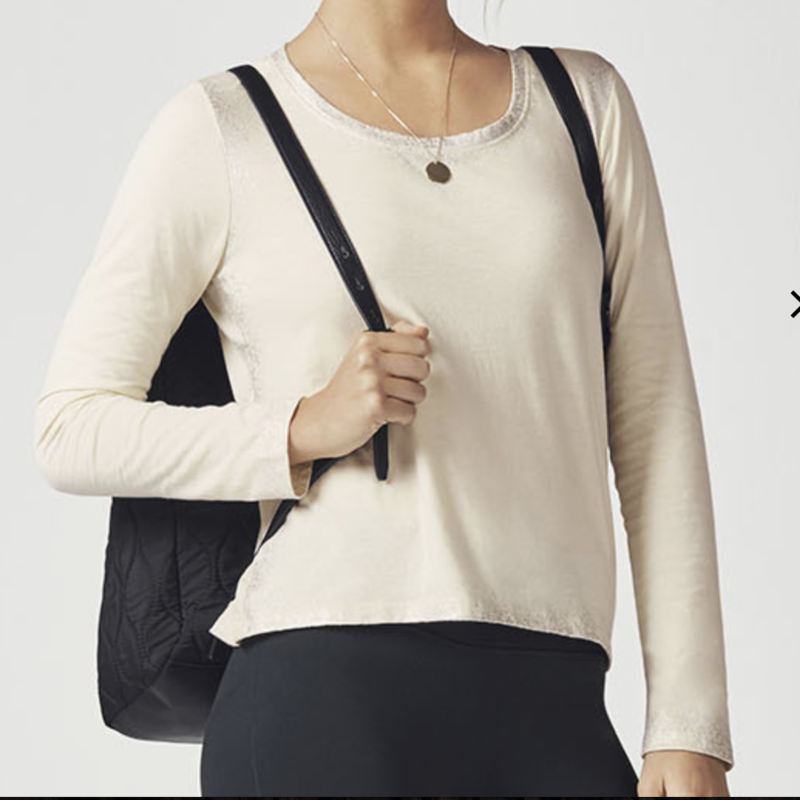 There were also two recent (meaning last year) pairs of workout pants, both of which were low-ish quality (limited stretch, thick enough to not be see-through but faded quickly when washed) that paired with un-usable tops (that oversized armhole problem again). Suffice it to say I haven’t been impressed with Fabletics but I’m still Me, meaning that I can’t resist a deal, especially when there is a Gift with Purchase. When the December Fabletics outfits were released, I was *thisclose* to clicking “Skip This Month,” but I lingered. This outfit is called the “Rory” and has a long sleeved tee with a pair of black tights with a cute detail at the ankle. Can you see that above? It’s striated. 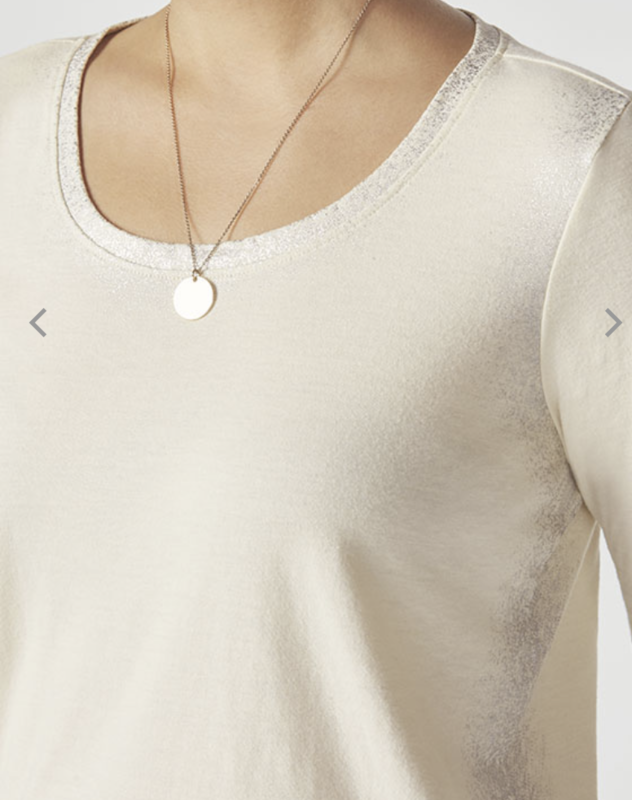 The top also has metallic accents at the neckline and on the side. With membership, the Rory is $59.95, not bad for a two piece outfit. And then: I saw the offer for a free bag with an $89 order. Free bag. As in Any Of Their Bags. So I looked some more, and the “Tara” outfit caught my eye. The Tara ($89) consists of an oversized funnel neck sweatshirt with leggings. It comes in three of the most popular colors of the season: millennial pink, off white and gray. Oh, boy, I was hooked. The stock was very limited, so I had to size up but I was able to order the pink top with non-special-but-functional black leggings. 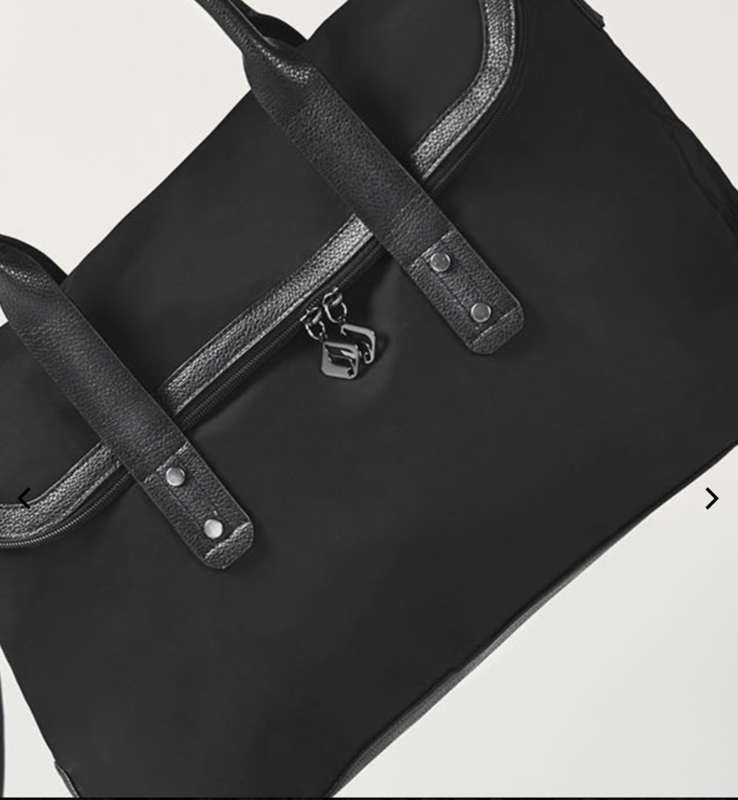 And the (above) bag was mine – for free! I’m still waiting for these to arrive, but it’s with anticipation.